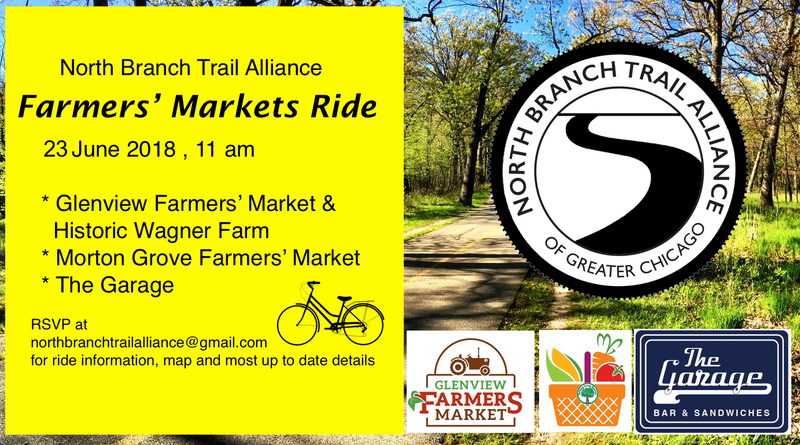 we invite you to our second ride this year- Farmers Markers along the North Branch Trail ! Spending time in nature, light exercise and healthy food are key to your well-being. This ride is all about it. We will start at 11 AM at the Historic Wagner Farm in Glenview - site of the Glenview Farmers market. You are welcome to arrive earlier and explore the market (it opens at 9AM). 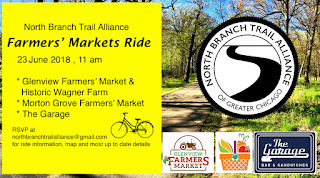 We will then proceed to the Morton Grove Farmers market, our only stop on this ride. The ride will finish up at The Garage Bar in the Gladstone Park neighborhood (in Chicago). Riders are invited to stay at The Garage and socialize.